Koh Kambaran is a mountain in Balochistan. It is located at an elevation of 2,568 meters above sea level.Its coordinates are 28°49’34” N and 64°55’37” E). On Monday, 11 May 1998 Indian Prime Minister Atal Behari Vajpayee stunned the world by announcing at a hurriedly convened press conference that earlier that day India had conducted three nuclear tests. International observers were, if anything, even more astonished by the announcement two days later that two additional tests had been conducted. 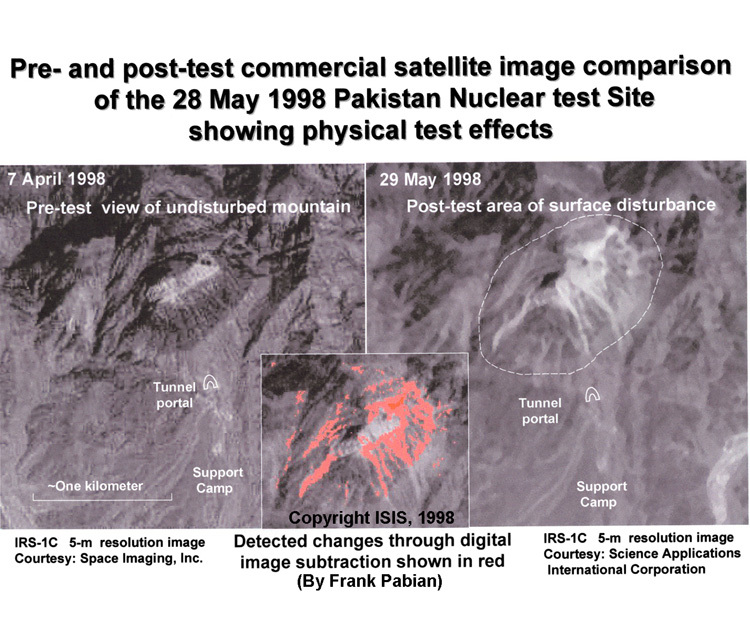 This act of India finally pursued Pakistan for a befitting response and on 18 May 1998, the Pakistani premier ordered his scientists “Dhamaka kar dein” (Conduct the explosion). 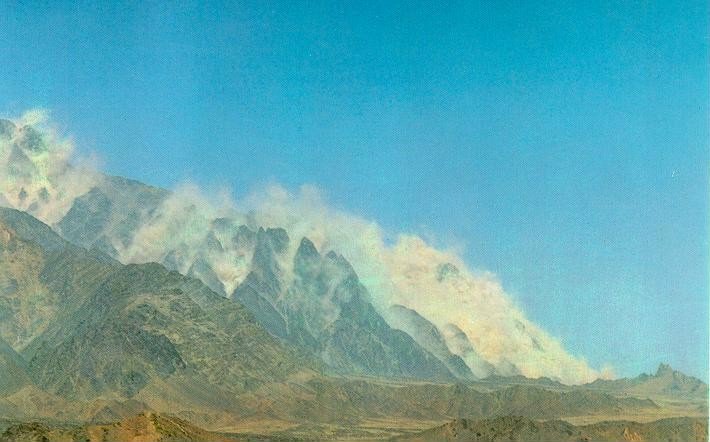 Ras Koh Hills are independent of and should not be confused with the Chagai Hills further north on the Afghanistan-Pakistan border, in which, to date, no nuclear test activity has taken place. 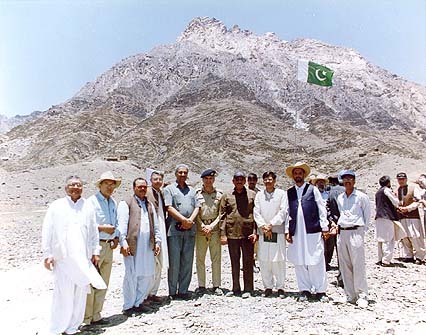 The Pakistani scientists posing with a nice view of Koh Kambaran in the background. A short while after the button was pushed, the earth in and around the Ras Koh Hills trembled. The OP vibrated as smoke and dust burst out through the five points where the nuclear devices were located. The mountain shook and changed colour as the dust of thousands of years was dislodged from its surface. Its black granite rock turning white as de-oxidization from the radioactive nuclear forces operating from within. A Huge cloud of beige dust then enveloped the mountain. The time-frame, from the moment when the button was pushed to the moment the detonations inside the mountain took place, was thirty seconds. For those in the OP, watching in pin-drop silence with their eyes focused on the mountain, those thirty seconds were the longest in their lives. It was the culmination of a journey which started over 20 years ago. It was the moment of truth and triumph against heavy odds, trials and tribulations. At the end of those thirty seconds lay Pakistans date with destiny. The Pakistani Ministry of Foreign Affairs would later describe it as Pakistans finest hour. Pakistan had become the worlds 7th nuclear power and the first nuclear weapons state in the Islamic World. Two days later, Pakistan conducted its sixth nuclear test at Kharan, a flat desert valley 150 km to the south of the Ras Koh Hills. This was a miniaturized device giving a yield which was 60% of the first tests. A small hillock now rises in what used to be flat desert, marking the ground zero of the nuclear test there.